Earlier this year Ubisoft CEO Yves Guillemot confirmed Beyond Good & Evil 2 is in the works - he just didn't reveal much in terms of progress or when it'd be released. One thing he did say though was that once Ubisoft had something to say about the game, it'd be sure to let us know. 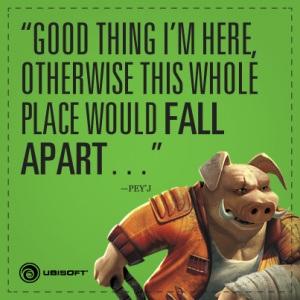 Well, E3 is a couple of days away now and Ubisoft has decided to post an image of the porky Pey'J on its Facebook page with the quote "Good thing I'm here, otherwise this whole place would fall apart". Intriguing. We certainly do remember this classic character, could we be seeing him emerge during Ubisoft's presentation on 10th June? Well, we don't have to wait too long to find out. Michel Ancel is the creator of Beyond Good & Evil and is currently working on Rayman Legends. However, it's not totally unfeasible that he's been working on both, considering the majority of Rayman Legends has been complete for a while now. What are your thoughts on this? Would you like to see Pey'J and the gang pop up at E3? Let us know in the comment section below. Oh please God make it so. 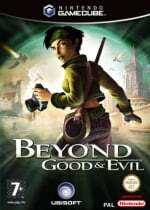 Here hoping we see Beyond Good & Evil 2 at E3. Interesting how Ubisoft chose a quote with the word fall in it... Okay I'm reading too much into this now! I recently just bought the first one for Gamecube. I'll be honest, I've never played it. I'm hoping it's as good as everyone says and if so, I hope that the sequel makes its way to WiiU. Knowing Ubisoft there's a good chance that'll happen. Man completely threw me off guard. I forgot about this game. Again. lol. First one was fun. Here's hoping they'll announce it's coming to Wii U. Should be Wii U exclusive. Letting this game exist could be Ubisoft's apology to Ancel for the Rayman mess. Please please please. The 1st one had it all!!! ... Combat, politics, government conspiracy, air hockey, hovercraft races, treasured inter-species friendships, photography side quests and vehicle upgrade by the boys at Mamago!!! A stunning adventure! This E3 could be amazing. I am so looking forward to it. I need to play the original again, it's been years. What a great Gamecube game. The Wii U controller would lend itself perfectly to BG&E2 if they stick with the photography angle. If the new Assassins Creed game and Splinter Cell are on its way, and Ubisoft has stated that it will support the Wii U with games that it needs (see NL's article on May 18).. I see no reason why they wouldn't add Beyond Good & Evil 2 to the list. Then again, the games been rumored for years, maybe its just another tease. Nothing surprises me at this point when it comes to the industry and E3. The idea that Pikmin 3, Ace Attorney 5 and Beyond Good & Evil 2 could all be at one E3 sounds like a dream scenario to me. BG&E2 will be at E3, I am a little worried about it being on Wii U though. This game is long overdue and I think one reason is they were waiting on the newer more powerful hardware. If the Wii U does manage to get it, then the U does stand for Ubisoft. Now this is reason enough to get excited. This is going to happen. It's been talked about forever, and it's time to come to fruition. I was one of the many who overlooked the first one originally. Sooooo glad I gave it a go years later. If only this game would be released on the Wii U. I played the original only once so I can't say I am an uber fan of this series. I will say that it was pretty fun though. I always wanted to play the first game but never got around to it. I don't own any of the systems it was originally released for so I am going to have to download the HD version on psn. I never played the first,is Nintendo releasing GameCube games on the Virtual Console? @LtAldoRaine Nope. Not yet at least, but I'd actually be surprised if that was happening any time soon. @CanisWolfred I wonder why Nintendo is re-releasing gradually the VC games that already were on Wii,instead of making everthing avaliable now and focusing on re-releasing the ones that weren't on Wii. I can't think of one reason of why what they're doing is better. Loved the first one, played it on Wii - so i'm one of the 5% who uses backward compatibility! Glad they are revisiting this franchise, i really enjoyed the characters, story and art design in the original game, the gameplay was superb too, I will definitely get BG&E2 if it arrives on Wii U. This would be a game worth my hard earned cash. I still have the gamecube version which my children are now working their way through.